There's not many things that will get me out of bed at 6:30 am in the morning on a Saturday, a trip to the Metrocentre is one of them. I'm that keen to get to the shops before the crowds that I'm quite willing to leap out of bed just to beat everyone else to the changing rooms. Last weekend I decided to go for a wander around the shops to try on a few clothes in the hope of finding something nice for my birthday. Unfortunately it was one of those days where I found nothing to get me excited (apart from some My Little Pony PJs in Primark that I may well go and buy this afternoon) so instead I spent most of my day looking forward to my cake date. One of the best things about blogging, especially when I'm setting up life in a new city, has been the lovely people that I've got talking to. I've recently joined a fun new twitter chat on a Sunday evening especially for bloggers over 30. We tend to spend the hour reminiscing about our awful 90s fashion mistakes, boy bands we lusted over in our teens, Heather Shimmer Rimmel lipstick and encouraging each other to run round the supermarket hunting out Um Bongo and Sunny D. Lucky for me Lisa, one of these lovely ladies lives very close to me so we thought it would be a nice to meet up for some cake. excited about meeting up with her for some sweet treats. She was just as lovely in the flesh as she is behind her computer screen and I'm very pleased I've found a new friend who loves cake as much as me. 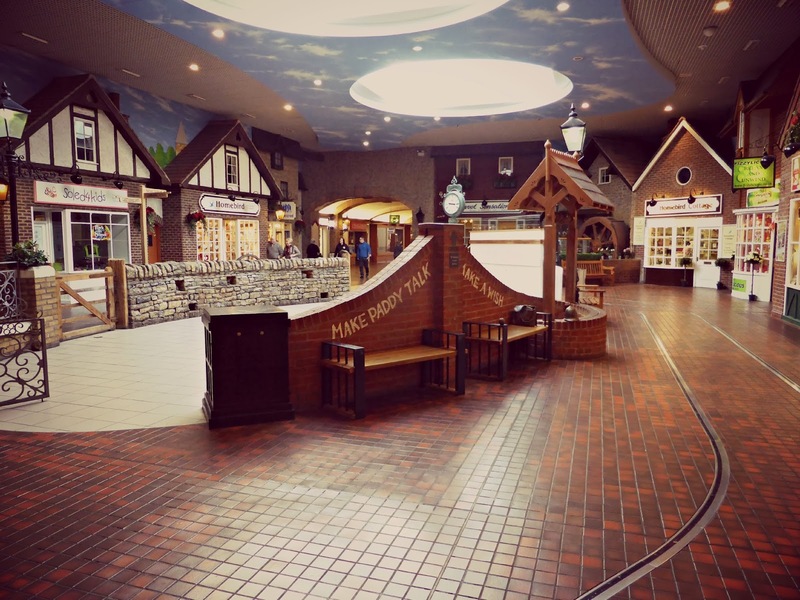 The Metrocentre has a few nice places for cake if you know where to look. 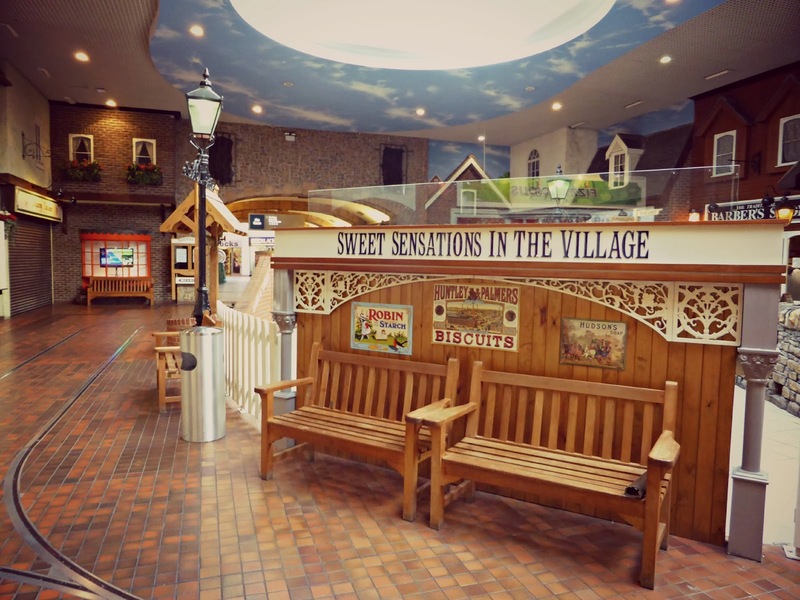 Sweet Sensations is situated in the Village which is an area of the mall that I really love. As soon as you turn the corner into the Village you are suddenly far away from the hustle and bustle of modern shops and transported to a quaint traditional village with gorgeous shops in pretty buildings. 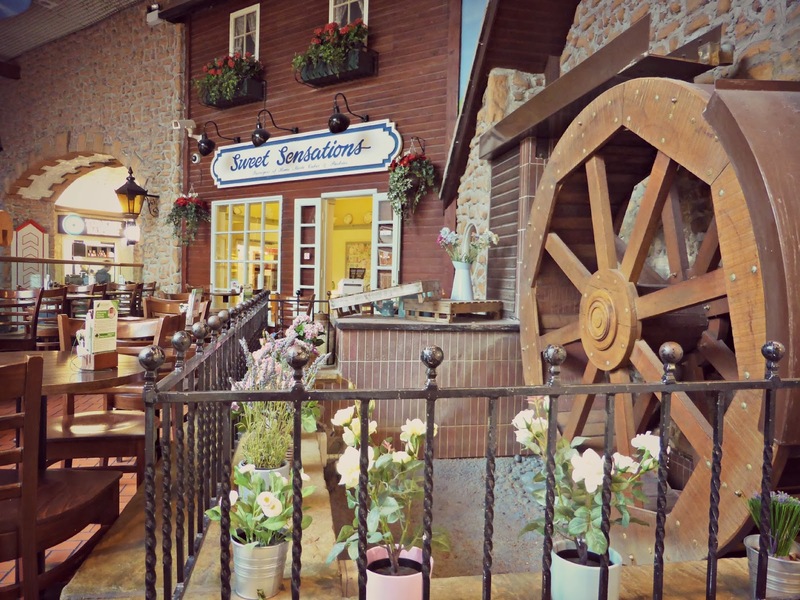 Sweet Sensations boasts it's own little Mill and has colourful flowers scattered around. If you choose to sit "outside" you have a great position to people watch whilst enjoying your beautiful surroundings. I was really impressed with the selection of cake, I wanted a slice of everything so picking just one thing to have was very tough. The cake counter at the front of the shop was crammed full and just as I thought I'd made my final decision I realised there were even more cakes by the till. Talk about being spoilt. 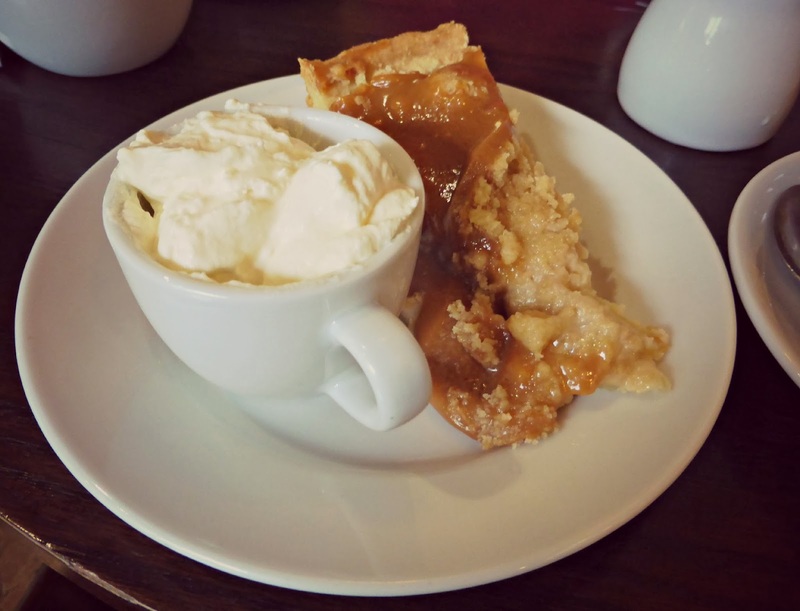 I eventually opted for a lovely Apple pie complete with a toffee topping which I had warm and served with cream. It was so delicious and a really generous slice. I will definitely be back for more, especially as I spotted they do afternoon tea. Lisa and I are already talking about our next cake adventure, our aim is to eat the very best and biggest cakes that we can find ... all for the sake of our blogs of course!